After this morning's fun and frolics in the garden, in the evening I nearly tripped over this fella on the lawn. Obviously my using the shredder and making a racket had no effect on it's evening stroll around the garden. 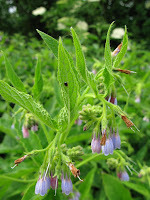 I just hope the slugs and snails are also on the menu ! Someone told me recently this was a) June and b) summer. Looking out of the lounge window just now, and having a day off, I'm tempted to say "Global Warming Doesn't Exist". Mind you the weird and largely sensationalist press we have in the UK have painted global warming as clear blue skies, hot weather and drought. It will be in some places of the World, but in the Northern Hemisphere as the atmosphere warms, the amount of available energy will rise leading to very energised low pressure weather systems, sadly therefore more wet, windy and cool summers. Nice winters though!!! Even the wildlife has come indoors. 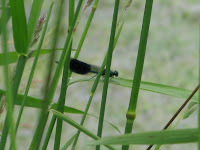 The lady (females have bristly tibia - she needs Immac) on the left is a very common long-legged fly, Poecilobothrus nobilitatus. 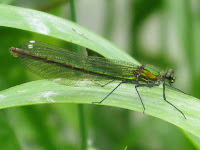 I have a lot of these on the pond, they're fascinating to watch as they rest on vegetation and use their white wing tips to attract a mate, by flicking their wings and doing a little dance. This one however was indoors drying off, as was the Carpet Moth on the right. Not entirely sure which one these moths it is, they're very variable, hot money is on the Common Carpet Moth, but if anyone knows different let me know please. So as the weather is dreadful, I abandoned my planned bird watch and gardening day. Instead a bit of spring cleaning of photos on the computer. And in a flagrant plagiarism moment, from an idea by Hedgewitch, herewith some photos of Ross Sands area of Northumberland, September 2006. 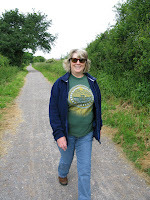 We walked the whole length from Budle Bay in a gale, a warm gale, and returned to hear that Richard Hammond of Top Gear had had a serious crash. So what were you doing that day? Gannets were diving out to sea, not a cloud in the sky and we had the beach to ourselves........ apart from an old crotchety sea dog that is. Ruins the view!! I found this Mermaid though which added something to the scenery. And in case you are wondering the fleece ear defenders were de rigour that season. I think she threw that shell at me later on? And who can blame her. And if you're interested have a peek here, the top photo of that day's posting is a largish painting (3' x 2' acrylic on canvas) I gave my Father for his 75th Birthday, the whole reason we were up there in September 2006. A reminder of when they used to walk the dog along the beach. Thelma said she'd like to visit the place I'd painted...... and I'm glad we did. Who needs the Caribbean? Mind you the photo's don't show the sand travelling at speed along the beach, it just gets everywhere, and possibly explains the lack of people? Well after yesterday's excitement at Silverstone I spent a quiet day at home messing about with frames. I tend to buy frames in bulk, from a framer in Yeovil, or a framing factory in the North East when I'm up there. So I always have a fair stock in and paint to fit the frame...makes life much easier. Also for me I like to sell paintings at a reasonable price, having standard sizes of frame and mount, keeps the price down, so what one is paying for is the painting. So today I was again looking at the frame and double mount I did for the clover picture I took in May. Do I still like it? 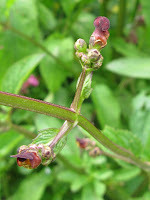 I think so but I thought if I put it on the blog, comments may make me think again or give me ideas. Part of me thinks a square frame and mount may be better for this type of image. Anyway the last time I was up in the North East, I bought a job-lot of rejected 10 x 8 frames. They'd been rejected by a business so were a steal, not least as I haggled the price too. I've not used thick frames before, as in deep. So printed off a copy of the mating Common Blue butterflies I took in early June, and framed it with a China White mount. Would a darker mount be better? Costing this up, the finished version was just under £5, so if I say sold it for £20, then that's a 300% profit. Mind you who would want butterflies mating on their wall? And obviously if an original painting was in there, it would be slightly more expensive. And that's really the thoughts of this posting. It's a well known fact that a good frame and the correct mount can make a painting really sing, conversely a bad frame and mount can destroy an image. I think this is why so many people who frame their work, play safe with pale frames and mount........ I know I do! 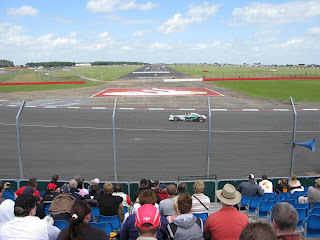 Yesterday I found myself being invited to Silverstone, home of the British Grand Prix, to watch F1 testing. I have to admit I know very little about the F1 scene, so it was good to go and do something new and see what's what. Gloriously as this is testing, not Race Day (July 6th), the place was quiet and we were able to wander about at will, no queues for the loos and chip van.. a must for me! 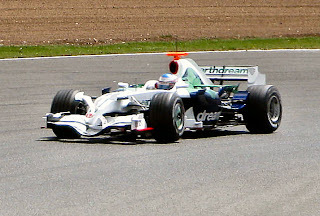 My companion has connections with Jenson Button, so here's 2 photos of the boy doing his stuff. His car is sponsored by EarthDream, a project for make F1 more environmentally friendly, so he gets my vote and of course raise his profile on my blog..........:-) !!! 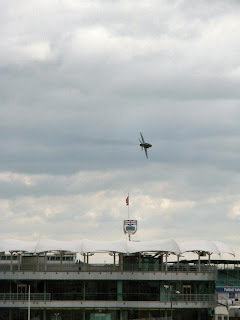 We also had some flying things....... a very low unscheduled flypast by a Hunter aircraft, that woke the crowd up at 8.45am I can tell you. 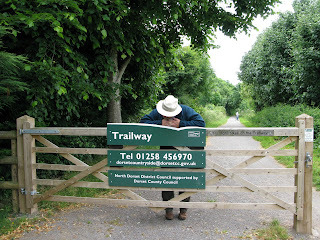 But I hear you call, this is a Wildlife Blog BR, where's the wildlife? Well this is why I'm writing this. I was fascinated by the birds on the Circuit. During the day while watching the cars, Rook, Carrion Crow, Kestrel, Buzzard, Pied Wagtail, Swallow, House Martin and Swift were constantly present, and bunny's, though sadly I never saw a Hare. There is a healthy population on the Circuit. The Swallows interested me. It may have been coincidence but when testing was taking place they were everywhere on the wing, and then when it stopped, they largely disappeared. Those F1 cars don't half make a racket, even with ear defenders on, so I began wondering why they flew more readily in this situation. All I can think of is that when the cars are out, the noise and vibration is such that it must lift insects up off the grass, and so the Swallows have learnt to take advantage of this feast. Plus the slipstream behind a 200mph car must cause chaos for weak flying insects, again easy pickings. The Rooks and Carrion Crows also seemed to ignore what was going on. Quite a few times they only flew a few feet away as the cars approached, then back onto the verges to presumably pick up an insect casualty or two. Hopefully this spider didn't succumb though, it sat on my knee for ages watching and waiting. 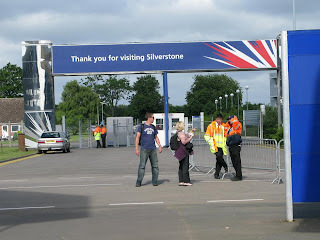 Silverstone will never be a wildlife sanctuary, but what is there does seems to co-exist with the Petrol-Heads quite happily, and if you think about it, for 50 weeks of the year it's a quiet place, closed off to the public. I was reflecting the other day (partly as I need more book shelves, partly as my ideas over my book are being formulated), what did we all do to learn about the World, before the Internet? We'll I for one read a lot more books then than I do now. The Internet is such a huge source of information these days (mind you a lot of it isn't that great) that if I need to look something up, or identify a small insect, plant or so on, I often use the web first. And while I think this is not a bad thing, I just wonder how many teenagers today were like me and bought book after book on their latest hobby or interest. But then I was odd. Most teenagers I knew were chasing girls, playing "split the kipper" with very scary knives or lounging about in fields being bored and shooting things with air rifles. I did that of course, but I always came back to nature as my reason for living. But like many others, I forget that even 10 years ago, the Internet was in it's infancy, 20 years ago no one really knew about it. In 1986 I got a job as one of a team of 12 computerising a large Central Library in the North East, and it was just the most amazing job, as my love of books was combined with new-technology. We had infrared keyboards, which was great fun as we'd fiddle about with the frequencies and when someone was working, intercept their work. A good old laugh, but we got the work done, and after 6 month I was asked to be a "Librarian". I had my own date stamp and everything, and stayed for 3 very happy years, before the call of the wild drove me to Newcastle University's Agriculture Department. But what was I reading 20, 25 years ago? Being in the "book trade" I got to hear about all the new wildlife and related titles and bought everything voraciously, via a preferential scheme, 20% off, as well as from bookshops of course. So this morning I've had a very swift look at the BOOKS ONE HAD TO HAVE in the 1980's. I thought I'd share some of these with you, it's been fun looking at them again in the 2000's. They're a bit dusty though (click on a photo to enlarge). Starting with BB. For me the most important influence on my life. Classic Poacher turned Gamekeeper, he like Peter Scott and others realised the world was fast changing, and conservation was the future. He did great work on the Purple Emperor butterfly, although these days his methods would be condemned. But in his time, a great conservationist. I was a member of the Mammal Society in the 1980's and bought many a learned pamphlet. Mustelids (Otters, Badgers and so on) are my real interest, particularly Otters as for a few years I surveyed, trained up volunteers and just generally became obsessed, during the dark days when an Otter sighting became national news. Wonderfully today they're back with a vengeance. To really understand Wildlife, one needs to understand fully, the history of land use, especially in a country like the UK, where every piece of countryside is man made and managed, underlying geology, and therefore soils, hydro-graphic principles, aspect, and so on. The list is endless. But those books above have provided me with so quality reading. Oliver Rackams History of the Countryside is a must, as is Silent Spring by Rachel Carson, which while this didn't kick off the conservation movement per se, brought the mess of the post war years and poisoning of the land, to the public attention. And these are just great reads, though I must admit, looking at my Otter books, I have too many really, I must have bought everything that came out. Mind you these Helm guides (on the right), although dated are still valuable tools. Which brings me to my final story. I made a complete prat of myself years ago. I was at a Mammal Society Conference in Leeds, and was honoured to be having lunch with Ernest Neal, the undisputed Badger Man. Being a spotty overly enthusiastic 20 year old, I blurted out to a companion as a way of introduction, "this is the great Ernest Neal, you know the badger man, writes books and everything, he's great [sic]". To his credit, a reserved and true gentleman, he never batted an eyelid, but I could tell what he thought about me. But the lunch went off splendidly, and despite my gaff, I am truly grateful that for that short time at least, I was in the company of a great man. Maybe one day I'll tell you about my first meeting with Sir David Attenborough, and how I nearly knocked him down the stairs.... but that's for another day. 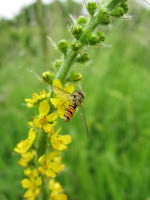 Very little wildlife watching this weekend, but gardening thoughts on my Gardening Blog. The weather though was odd, the rain didn't arrive, but we had strong wind, not as strong as my parents had. They'd been up to Rothbury in Northumberland looking to buy a house, and apparently they were in the middle of an autumnal storm. What the wind did do though is bring out wonderful aerial displays from both Hirundines and Gulls. 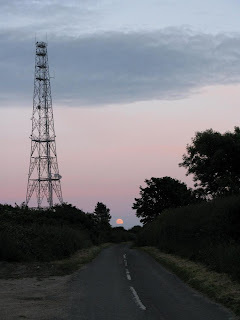 As I drove back over the Mendips last night, Martins and Swallows were almost playing "chicken" with the car as they swooped and soared just feet above the road surface and under trees. Gulls were higher up but they seemed to be also enjoying just playing on wind. So the above photograph is totally unrelated. This was in 2006 when the beach at Lyme Regis was re-built. I took quite a few arty photos at the time as the orange earth movers were, to me, like Dinosaurs in the Jurassic Coastline, overshadowing Golden Cap behind. So next time you go to Lyme Regis, remember that's 30,000 tonnes of French sand and 50,000 tonnes of gravel, dredged from the English channel you're walking on. Also a couple of other bits of news. 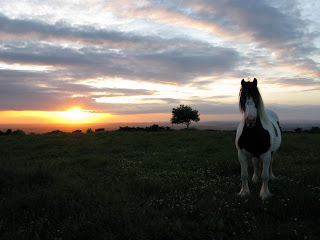 My photo on Tuesday's posting, the one with the horse and sunset was used as background on the Points West weather bulletin on Friday, which was nice. And speaking of the meeja, those of you listening to Radio 4 tomorrow morning at 11, can hear about the doings of migration on World on the Move. I had lunch today with Brett the presenter and as ever, it's always a tonic... a real laugh a minute. I know quite a few people who read my ramblings, have leanings towards Alternative and Pagan views. My cousin who is webmaster for the Pagan Federation and I have discussions about this. I believe in a spirituality related to nature, and conversely nature leads to a spirituality of the soul. Whereas he is more into meta-physical views. Strangely a few months ago I had the Mormons call at the door. Two nice men, who then had a bizarre conversation with me about Paganism. I think I may have inadvertently converted one of them, as he was very interested in what I was saying, and had a second cup of tea. Anyway, at the moment we're at the peak of the Summer Solstice, Midsummer's Eve, Litha, St John's Day, Festival of Attainment, or whatever you may call it. Long before I knew why, I've stayed up all night on June 21st, right from being a small child. It's also my grandfather's birthday, he'd have been 109. As this is an important day for me, I'd just like to wish blessings to those of you who are celebrating, wherever you are, and also blessings to those of you who are of different beliefs. Humanity is something we all share. 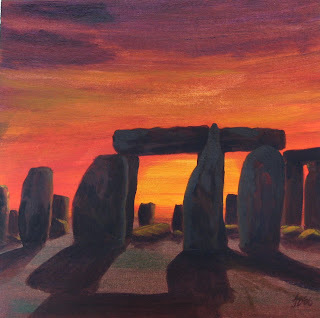 In 2005 whilst developing my arcylic style, I painted this picture during the Solstice. I sold it a few weeks later, so somewhere out there it's hopefully still giving someone pleasure. 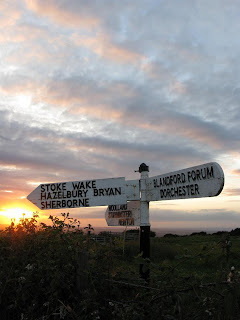 And in 2006, as the three photographs show, we found ourselves at the most important place for me in the whole of Britain. I will only say it's a hill fort in Dorset. I found it by accident in 1983 when having a holiday near there, after taking a drive on mid-summers eve. Not knowing where to drive, I can remember driving along what I now know is a Roman Road, and being stopped in my tracks at the beauty of this place. I was the only person there that Midsummers Eve, in total silence apart from the wind off the sea, watching the sun set over the English Channel. A memory I will never forget. For years afterwards I used to come here from the North East to sit on the hill and look at the view. Enjoy this time of the year, and whatever you do, or don't do, be at one with nature and remember all those people who once also saw the sun rise. Happy Birthday Grandfather wherever you are!! A true Gentleman in all ways. Just a quick posting today, good to get back to wildlife. On the way back from Dorchester Hospital, the route takes us past the Stock Gaylard estate near King's Stag. This estate has both ancient trees and a herd of Fallow Deer. There is a saying that if the deer are near the road, rain is imminent. Which meant even though had to use the x24 function, they were close enough for a couple of shots. And sure enough as I write this it's pouring and a gale is blowing out there. I'm sure the calendar says June? I don't usually talk about my job on the blog, but what a day! Having been party to 3 redundancy initiatives in 4 years, this last one has taken it's toll on everyone. No one has come out of this without feeling battered and mentally bruised. So as happens many times, once the management team have done their stuff, who's next. Yesterday, our boss announced she was "being asked to leave" and so the future is not bright, nor is it orange. I'm quite excited in a way as I'll be free to do whatever I want, but sad that it's an end of an era, both for me and dear old Auntie. It had to happen, television as we know it is a dying media; content provision, the internet, multimedia, and radio are all the future now. Many of the changes are vital to the survival of dear old Auntie. So as this is the very last time the team will all be together, we de-camped to Rucolas in Bristol's "fashionable meeja" area of Clifton for a long reflective lunch, lasting from 1.00 until 4.30pm. This restaurant provided wondrous goodies of the Mediterranean region, so what did the boy Border have? ....... Sunrise Sunset : Grilled Lincolnshire Sausages, Back Bacon, Tomato, Potato Waffles, Two Fried Free Range Eggs, Toast, Butter + Preserves. A marvelous way to celebrate!! So after lunch, drove down to Dorset, which was planned as Thelma has her bi-monthly oncology check up today. I needed fresh air, and to be a million miles from work. 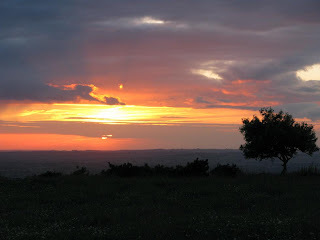 So Bulbarrow Hill it was after a cup of tea, and to take in a sunset. Not much wildlife up here last night, nice Yellowhammer, above, a few Kestels, a Buzzard and other than Hirundines, that was about it. Lovely to be up there though. However driving home at 10pm. I said to Thelma, keep a look out for Little Owls on the top of posts.... 2 miles further on at Bagber a Little Owl (149). My first of the year and Thelma's first ever "oh aren't they small she said". What a wonderful way to end a strange day. Puts it all into perspective!! And so to the sunsets! Border Reiver is on the road to nowhere!! And it's a full moon tomorrow! Border and his latest squeeze, decided to go for a walk this morning and a bit of a recce. I've posted a walk along here before in March. However this is the first time we've walked from Sturminster Newton to Shillingstone, as this part was only opened up a few weeks ago. About 3 miles each way. Don't worry I'll not describe the walk, which I tend to find involves one foot in front of another, in a fairly regular forward motion. 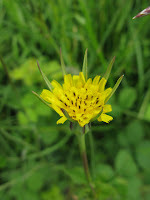 Maybe best just to let the photos do the talking of some highlights seen (as ever enlarge for a better view). 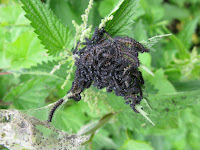 Left : Peacock larvae on nettle, and Right : "False Oil Beetle"
I have to say the 3 hours or so we took to walk the 6 miles was a great way to sharpen the appetite for luncheon. Most noticeable were that Chiffchaffs were still in good song, but there were very few butterflies around. 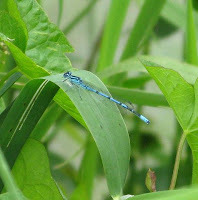 I saw three during the whole walk, a very tatty Red Admiral, a Large White and a brown job. 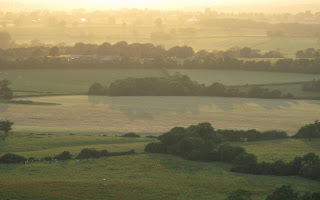 I also located the Barn Owl spot, so one evening in the not too distant future, I may be seen there. 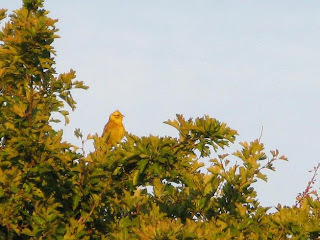 The one other notable was a female Yellowhammer carrying feed, followed by a singing Male further on which flew into a wheat field. Great summer birds. 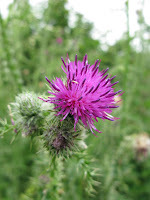 So it's been a busy old weekend blogging wise, that's 1 posting yesterday and 2 today. I need a rest and a cup of tea. Mind you we did stop for a half a shandy at the Saxon Inn Child Oakford on the way back. Seemed churlish not to as we were passing.